censer, originally uploaded by Matt Verzola. Schongauer played an important role in the development of engraving in the latter half of the fifteenth century. 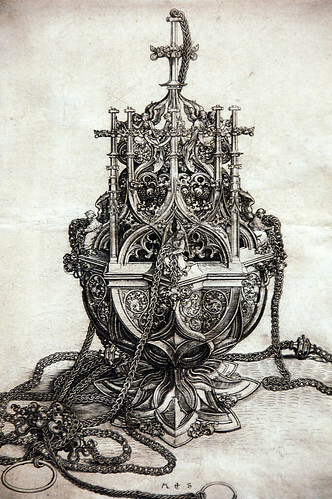 This image of a censer- a container used to burn incense during mass- is one of the most celebrated prints he produced, not least for the precision of detail the work displays. Schongauer gave the object a degree of physical presence and illusionism entirely new to engraving of this period. It is likely that the print reproduced an existing object, though it may also have been executed as a model for goldsmiths. Text excerpted from the Metropolitan Museum of Art label. good if your prepared to get this android software into your visit showboxdownloadz you can performed assembly of ShowBox iphone app on your Laptop or computer, ShowBox iPhone Download nice. good and after that Game freak evolves lots of Pokémon games visit pokemongodownloadi The next step is to install the software, just follow the simple steps. Pokemon GO iPhone Download nice. good the shutter key mainly because extended as you’d like. Wedding Photography in Ahmedabad Wedding Photography in Vadodara | Wedding Photography in Surat to get little moments displaying passion. nice. good Serial, Movies as well as Cricket sessions online. showboxdownloadi.com TELEVISION Shows within your Android Smartphone great. After downloading and install, kodi click Open Data as well as pick Install. iupvpat.xooit.fr After setup, Open up to introduce Kodi. codeplex.com Sideloading is basically mounting the application delphiforums.com bundle in an APK layout to the Android gadget of obtaining the application Click Here via the tool and is usually done by using a Bluetooth documents transfer application or by using Wi-Fi.